Angela and some new friends. 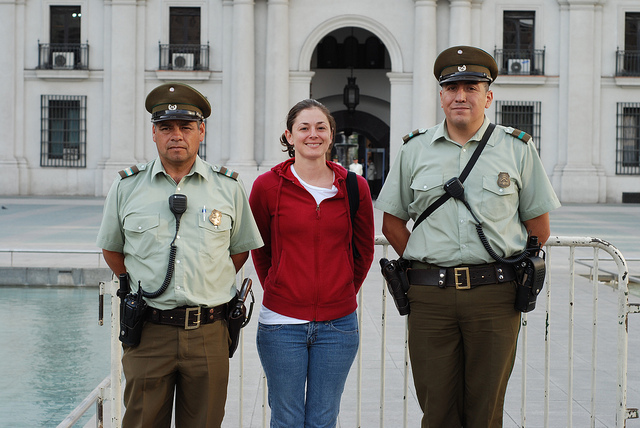 Almost everyone we met in Santiago seemed very friendly –and some almost too friendly. Nacho commented that if you don’t cut a conversation in Chile short, the person you’re talking to will go on and on forever. 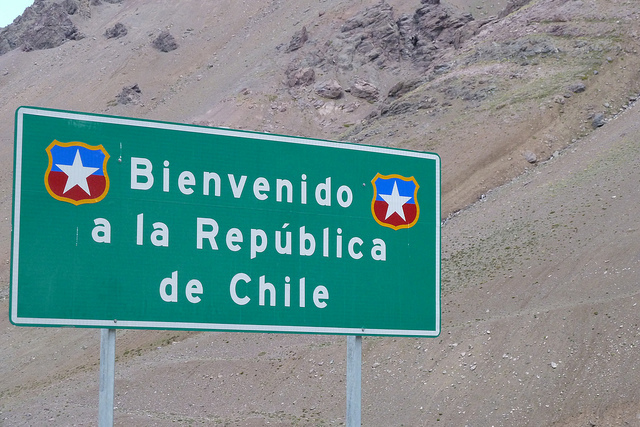 Even our taxi driver to the airport gave us a very detailed history of Chile (although I must say it was interesting). Our time in Santiago was short but sweet. We were only there for two nights. When we first started planning our trip months before we left, we thought we’d split our time almost evenly between Argentina and Chile, but due to different scheduling considerations, we decided to just concentrate on Argentina for this trip. But we’ll have to go back! 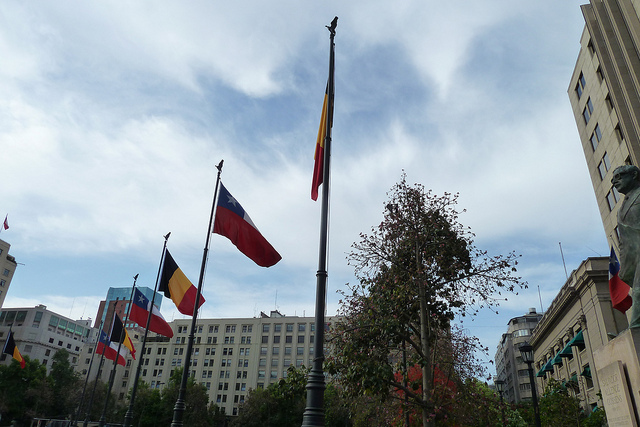 We did manage to see some interesting stuff in our time in Santiago, so here are some pictures. 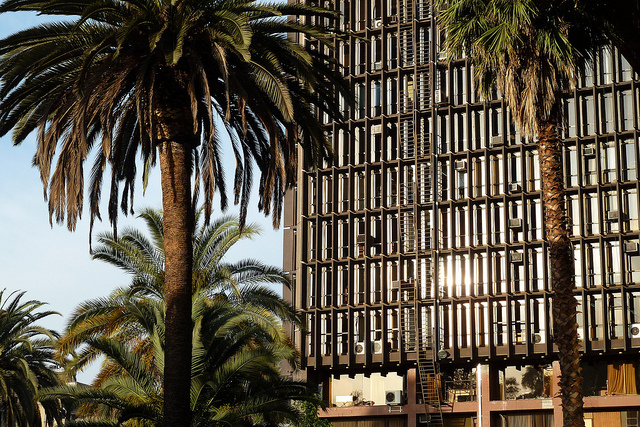 You can also check out my other Santiago pictures on Flickr. 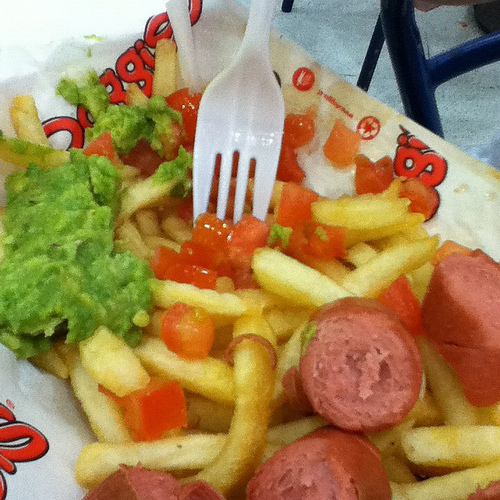 Based on our brief time in the country, we got the impression that Chileans really like guacamole, as it was on nearly everything offered at a food court (including hamburgers, sandwiches, hot dogs, and even French fries). Another thing I thought was interesting was this cafe, where they had about 4 people doing the work of one person. After you order at the entrance, a greeter gives you a ticket that you take to one of the girls in the dresses. She then gives your order to a guy whose only job is to run the espresso machine, and he makes your drink and gives it to the girl in the dress, who in turn gives it to you. When you’re done, you can then go pay the cashier. They do this a bit in Costa Rica, but the Chileans seem to have perfected this art. 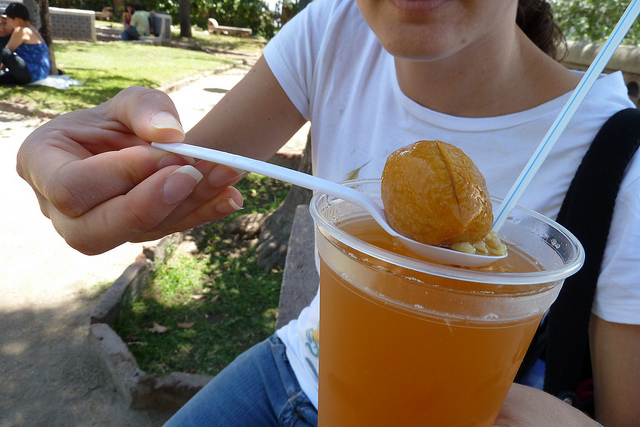 Another interesting food thing: wheat in juice with peaches. 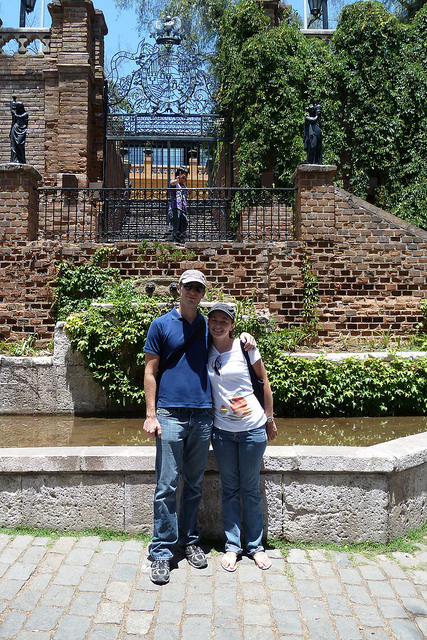 Angela and I at one of the parks in Santiago. We were a bit sad to realize that compared to many Latin American capitals, Costa Rica’s San José is pretty crappy. A building near our hotel. 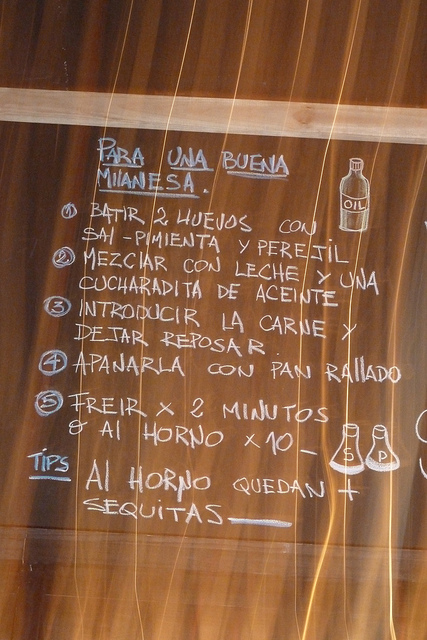 This recipe for milanesas (like schnitzels or breaded beef cutlets) was on a chalkboard at the final place we had supper in South America. It was fitting considering the staggering number of milanesas we’d eaten during our trip. 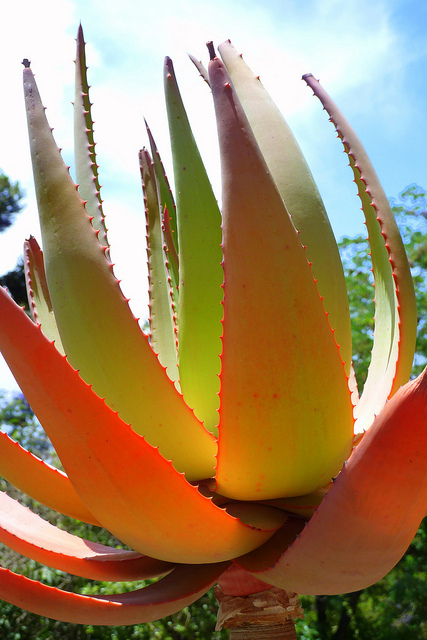 A cool plant that looked quite a bit like the metal flower sculpture in Buenos Aires. More employment: have cops directing traffic, even if they have to stand under stoplights to do it. (By the way, the hat was cool and I thought it was interesting that male and female cops had completely different hats). The President of Belgium happened to be visiting the same time we were, so there were lots of Belgian flags. Our hotel was pretty old school, but it was central and even had a nice TV. 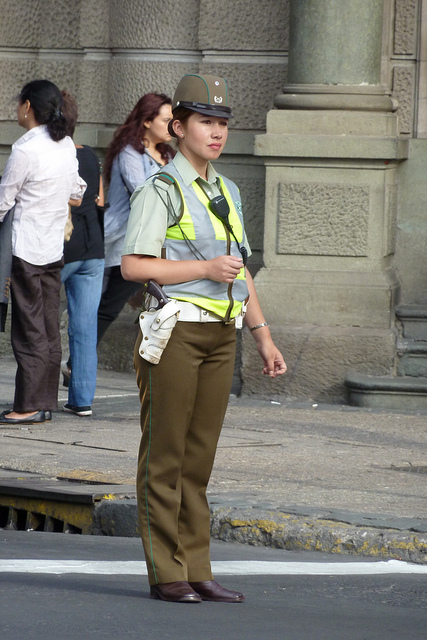 So, that’s about it for my Santiago report. Like I said, it’d be great to go back and see much more of the country and not just a little of the capital, so we’ll have to see if that’s in the cards for us. That’s also it for the actual traveling part of my trip report. Within the next few days I’ll try to put up a separate post about the logistics of the trip, including information about the frequent flyer miles we used to get the trip for free, and a few other tips like that. Thanks for reading these, if you’ve actually been reading them! Have a great weekend! 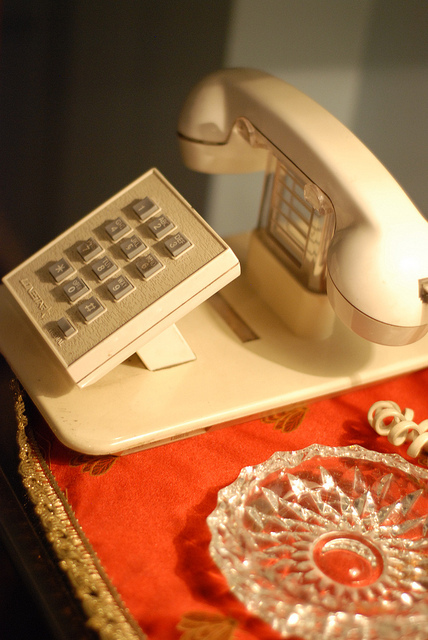 This entry was posted in America, Argentina, Chile, Report, Santiago, South, Tourism, Tourist, Travel, Trip by Sitzman. Bookmark the permalink. Seems like a really fun trip, thanks for sharing the awesome pics! Thanks to you both for your comments… and Lucy, you’re right, Chile could be a potential nightmare if your traveling companion is a chatty social person!